Just in time for filling baskets I share with you my duckling pattern. They look really cute in pale blue & pink too. If you make one I’d love to see it! Gauge: Not important with this at all but you want a tight knit so the stuffing doesn’t show. kfb – knit front and back – knit a stitch, leaving stitch on left needle; knit into the back loop of this stitch. Divide them between 3 needles. At this point you may want to bring your tail from the beginning through the center & tie a small knot on the inside. At this point stuff the body of your duck. At this point use the black yarn to make French knots for the eyes. Break yarn & thread it through all the stitches on the needle. Finish stuffing duck to the top of the head. Pull yarn tight. 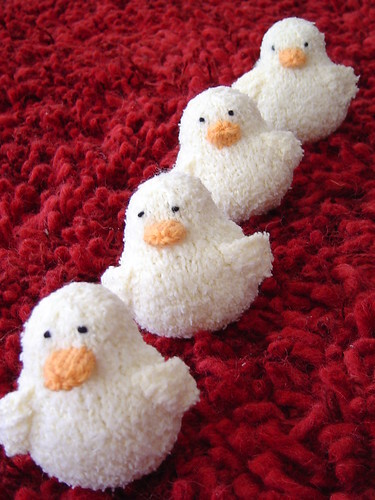 Make a small knot in the yarn near the top of the head & tuck tail into the body of the duck. Using tail sew the wings on to each side of the duckling. Sew just behind the decrease lines on either side of the duckling’s chest. Break yarn leaving a 6 inch tail. Thread the tail through the stitches on the needle & pull tight. Bring tail inside the beak & tie a small knot. You can put a little stuffing in the beak if you like. Sew beak on the ducklings face. Please do not sell my pattern, claim it as your own or teach it in a store without contacting me. You may link to it from your blog or site. With a color that contrasts with the body color, CO 6 stitches. Divide among three dpns. Break yarn leaving a 6 inch tail. Thread the tail through the stitches on the needle and pull tight. Flatten the muzzle into a puffy circle, and bring the tail through the center to the back and tie a small knot. With pink yarn, stitch a small “v” for a nose. Sew the muzzle onto the bunny’s face. Knit as for the muzzle, except before drawing the final stitches tight, stuff the piece lightly. Draw the yarn tight, tie a small knot, then stitch through the puff. Sew the tail onto the bunny’s back end. With same color yarn as body, CO 10 stitches. Row 1: k5, wrap the next stitch (yarn forward, slip next stitch purlwise, yarn back, slip stitch back to left hand needle). Turn your work. Stitch the ears to either side of the top of the bunny’s head. You’ll find the knitting naturally curves in one direction or the other. You can point the ears in different directions, or both the same way, or whatever gives your bunny the personality and individuality you like. You now have a small, narrow strip of garter stitch, with tiny points on one edge. Sew this on top of the chick’s head, running from front to back, with the points facing up. 12 years ago by Kat in Easter , Holiday , Knitting , Knitting Projects , Needlecraft , Projects | You can follow any responses to this entry through the RSS feed. You can leave a response, or trackback from your own site. Those are ADORABLE!! I think that each member of my family may have to have one of those in their easter baskets this year! Thanks for the pattern! VERY cute! The Things squee’d with glee when they saw them. I think they’d make cute baby gifts, too (esp. since I have SO MANY baby gifts to make). Oh you!!!! These are so incredibly adorable!! I wish I had something in my stash for these. They are just too cute! Sweet pattern! Those are so cute! Those are too cute! All the fun of Peeps with out all the disgusting mashmallow sugary goop! I wonder if these peeps would expand and pop all over my microwave like those “other” easter peeps do — oy, the mess, but oh, what fun. I really like Homespun myslef. I almost use it exclusively for afghans or scarves. I agree about the rhythm. I practice a stitch on inexpensive bulky yarn before I get into a skein of Homespun. After row 22 there are 24 stitches. Are you supposed to knit 8 rows after that, or just 2? The pattern says Rows 23-30: k, but the next line starts at row 25. So cute, I just love ’em. I’m going to try it with Plush, but could you post or contact me with more info on the Baby Teri yarn? Who makes it? Available online? Thanks for the great pattern! This is lovely! I’ve actually been looking for a cute duckie pattern for sometime now. Nice work! Thanks for the cute pattern. Can’t wait to see the new window display. But I know 3 darling little guys who’d love them in the mail from nana…THANK YOU! oh my goddess! those are just about the cutest things i have EVER seen. i’d also like to thank you for sharing the pattern as well. Beautiful! Gotta start on these as soon as my cloth is done. Such a fabulous pattern, Kat! Thank you for sharing. I’m thinking of doing my baby’s bathroom with a ducky theme and these will be great. Great pattern! I started making them for mini Easter baskets for my knitting circle, using Plymouth’s Oh My! yarn (with a scrap of Lamb’s Pride for the beak). After making one just as called for in the pattern, I began thinking of variations using different add-on parts on the same body base. I’ve now made a bunny as well, and am working on a baby chicken. My process has ground to a halt due to a minor hand injury, but I’ll be glad to share the patterns for the mods, including bunny ears, tail, etc. I can’t post them to my own blog until after Easter, because some of the recipients read there! E-mail me at fiber(AT)folkcatart(DOT)com if you’re interested. I figure folks might like to have my variations in time to knit them for Easter! Ohhhh! Those are ridiculously cute! I wish I’d seen them sooner…must buy yarn immediately. Thanks for the fab pattern! Those are way too cute!! Thanks for sharing! i’m going to make the pair wrigth now. What an adorable pattern! I will have to make a few myself. Thanks so much for sharing!!! These are so cute. Thanks for the great pattern. Wish I’d found it in time for Easter, but there’s always next year!!! Hey, I adapted the pattern for a penguin, feel free to link to my blog, or copy and post the instructions here for another edition of your cute pattern! OMG. That is absolutely so cute. I’m going to cast on after I get my yarn. Many thanks for the pattern. I am going to pimp your peeps on the Stash Bustin blog. This is the BEST way to indulge. This is the first time I have ever seen your blog. Your peeps are jsut precious!!! I also like the donuts. GREAT WORK! This is the first thing I’ve been interested in knitting since before Christmas–thanks for breaking my slump! I can’t wait to fill some Easter baskets! I’m planning on making these in a fuzzy dark yarn and stuffing them partially with beans as juggling geese (like from Firefly). I love your peeps pattern! I already made a couple, and I plan to make a bunch more to add to Easter baskets. These are adorable. Thanks for sharing. I think I will definitely be making some this week. Thanks so much for the pattern! 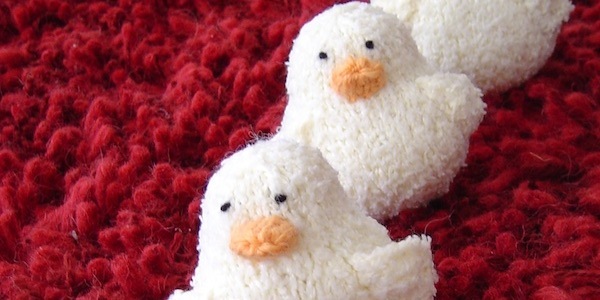 These are totally adorable and I just finished knitting one for my grandmother for Easter! Thanks again! Just darling! Made one ON EASTER! First attempt with DP needles and, thanks to your meticulous instructions, I have a darling ducky of my own! Thanks for sharing your talents so generously. Do us all a favor: Write a book! PLEASE!!!! Thank you so much I can’t wait to make these little guys. I think I will make one to send to Ethiopia for my soon to be adopted 2 yr old sister. I love these! Would you consider giving reprint rights to knitting pattern-a-day calendar? You keep all ownership, you just give us permission to print the directions and a photo. And on the sheet, we provide your name and a URL to your blog, website or charity of choice. You can learn more at http://www.knittingpatternaday.com or email me if you have any questions! I LOVE LOVE LOVE this adorable pattern.I am going to send one to my baby cousin. YAY!!! r u shur that these rnt trying to tak ovr our brans with cutness? Love these creatures! Thanks for the pattern. What kinds of yarn (type and brand) would make for furry-looking creatures? 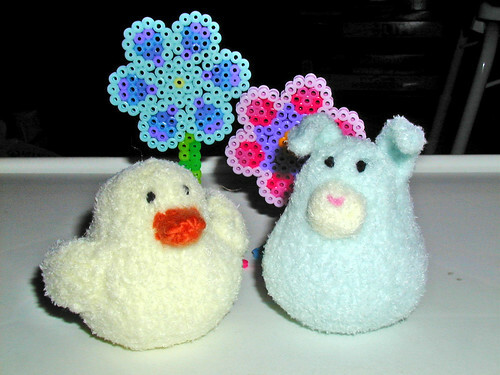 Dear Kat, what yarn did you use for the duckling and bunny in the picture you posted in your blog? No way! These are A-DOR-ABLE! I love them!!! Thanks so much for sharing this, I’ll be linking if you don’t mind. thank you for sharing, they are adorable! I saw someone’s finished peep today, and it was SO darling that I had to cast on not an hour later. I want to thank you for the great pattern! “Thanks!!!! !” Great design! Your very talented. Your works are very nice. Did you study art? Kat, your patterns are great! This is super cute can I post it on my blog. I am going to try my hand a making one or maybe even a few of these. They are so beautiful! I have a daughter who is almost 2yo who is obsessed with ducks (we have 4 as pets). So I'd love to make some of these as ducks and give them to her for her upcoming bday. I would love if I could use these for a easter class at my yarn shop. We do not charge for our classes and of course would not charge for your pattern. Would that be ok? Teresa – Please leave your email address or contact me through the Write Kat link in the right column so I can contact you directly. Thanks. Thanks for the duck pattern. I’m planning a baby shower for my daughter in March. She has a lt. pink, lt. green and monkey theme. So some ducks would be cute also. Pingback: Weekend Link Love – St. Paddy’s Weekend « That's StitchTastic! These are soooo cute, just wish I could get the hang of using double pointed needles. If only it could be done on two needles or short circulars. You could technically knit them on two needles & then seam it up at the end, especially if you were using a fuzzy yarn that would hide the seaming. The shortest circular I’ve used is an 8″ which is still too big for these little ducklings. Could it be done on a circular needle using the magic loop method? I’m sure it could, I’ve just never done it. I know a lot of people love magic loop, while I am a double pointed person. I’m normally pretty good at figuring out abreviations but this one has me puzzled. What is kfb and how is it worked? Thank you so much for this super cute duckling pattern. It makes me so happy to know that not only am I giving my family something hand made from my heart but I did not have to spend money we don’t have to do so. Bless your heart and if you celebrate Happy Easter to you and your family. Why do i have to use DPNs? Won’t this pattern work with just straight needles? You use DPNs because you are knitting in the round. Straight needles would require this to be a flat pattern that was seamed up at the end. With this pattern you basically knit the bottom, work up the sides, shape the head, stuff and then close up the top, no seaming at all. I am up to the top of the neck and can’t figure out which is the right side to put the eyes on, please help. The eyes go towards the top (you are knitting up to the top of the head). The front it the middle of your round, the section that increased up to k10 and them back down to k2. I’ve been slowly turning my old patterns into pdfs, but haven’t gotten to this one yet. You can just print the page directly.